Personal Introduction by Cotton Rohrscheib, CEO of Rohrscheib Capital, outlining his professional history, etc. Professional Bio for Cotton Rohrscheib, CEO of Rohrscheib Capital, Inc. that includes past work history, business interests, etc. Chronological timeline of Cotton Rohrscheib's business accomplishments, career highlights, and public service / appointments. List of business recommendations and endorsements from clients and partners that Cotton has worked with over the years. Use this contact form to send me an email or request information. I answer each request personally so please allow me time to respond (typically 24-48hrs). Use this 3rd party scheduling tool to schedule a meeting or quick phone with Cotton Rohrscheib to discuss your project. This page contains information needed to subscribe to The Cotton Club Podcast on iTunes, Android, and via RSS Feed. You can also download and listen to all of our archived episodes. Subscribe to our quarterly newsletter to receive news & information from Rohrscheib Capital about our current projects, business interests, products & services. I’ve actually seen this a handful of times in the past while attending seminars, training, etc., but I’m not sure that it’s ever resonated w/ me as well as it did this past month when our company started doing some time management training through a 3rd party. The “Eisenhower Method” stems from a quote attributed to Dwight D. Eisenhower: “I have two kinds of problems, the urgent and the important. The urgent are not important, and the important are never urgent.” You have to admire President Eisenhower, he was a great manager of time –and it’s said that he accomplished his tasks and still managed to play a tremendous amount of golf. Just for fun, do some research on Eisenhower, very interesting man. 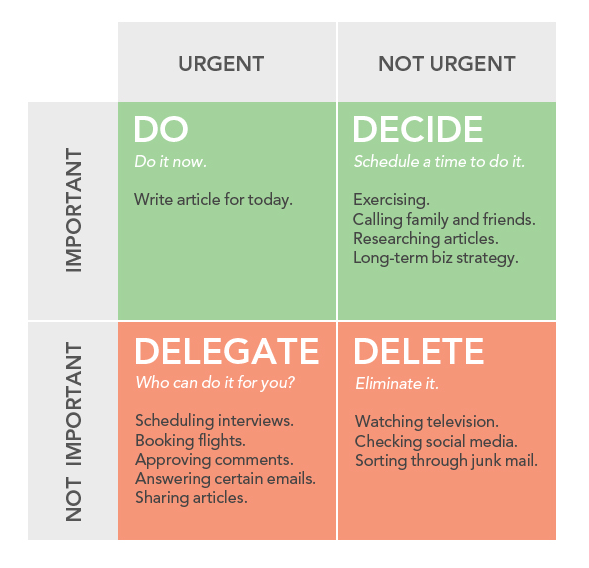 As far as the box above goes… you basically have to place your tasks into one of the 4 boxes above and decide how to spend your time after you’ve prioritized your tasks. It’s pretty simple once you get the hang of it, in fact, I sort of already do this mentally when I plan out my day. Cotton Rohrscheib is the CEO of Rohrscheib Capital Partners. Over the past 20 years he has been associated with numerous projects in the IT, Healthcare, and Agriculture industries. Born a serial entrepreneur, Cotton has personally been involved in several startups, product launches, and brand acquisitions during his career and has consulted on hundreds of projects for clients around the world. Today he still services the marketing and consulting needs for clients while trying to maintain a healthy balance between work and being a good husband and father to his wife, Donna, and their son, Spencer. I sold my web hosting company in 2018 to Cloud Equity Group / Cloud Access. If you are looking for a world class web host or maybe a complete website, look no further! Click on the link below to get started!